In bowl of stand mixer, pour warm water, sprinkle yeast over water, and then sprinkle sugar over yeast. Let sit for 5 minutes or until bubbly. Add honey, oil, eggs, and salt. Add flour 1 cup at a time. Add enough flour to make dough that just comes together and starts to pull away from sides of bowl. Knead. Turn dough out into greased or sprayed bowl, turn dough over to coat. Cover with towel and let rise in warm place 1-1½ hours until doubled. Punch down, turn out onto floured surface, and divide in half. At this point you can make two loaves, one loaf and 16 rolls, or 32 rolls. To make a loaf: Take one half of the dough, divide into four equal parts. Roll each part into an 18″ long rope. I braid my loaf on my greased or silpat lined baking sheet because I don’t like to move it after it is braided. Put the four long dough ropes on the baking sheet side by side. At one end, pinch the four ropes together. Start braiding by taking the rope on the far left, go under two ropes to the right, and back over one rope to the left, lay it down. Take the rope on the far right, go under two ropes to the left, and back over one rope to the right, lay it down. Back to the rope on the far left, go under two ropes to the right, and back over one rope to the left, lay it down. Back to the rope on the far right, go under two ropes to the left, and back over one rope to the right, lay it down. Continue until you are at the end and pinch ends together. Cover and let rise about 30-45 minutes. Gently brush with egg wash and sprinkle with poppy seeds or sesame seeds. Bake in preheated 350° oven for 30-35 minutes. To make rolls: Take one half of the dough, divide evenly into 16 pieces. Roll each piece into a 18″ long skinny rope. Twist and turn and wrap the rope around itself to make each roll. I wish I had some exact way of doing this but I’m not willing to take the time. ;o) I consider each roll a work of art. Place on greased or silpat lined baking pan. Continue until you have shaped all the rolls. Cover and let rise about 30 minutes. Gently brush with egg wash and sprinkle with poppy seeds or sesame seeds. Bake in preheated 350° oven for 12-15 minutes. This is a perfect throw together, use what you’ve got in the fridge and pantry kind of dinner (or breakfast or brunch). Use the basic recipe and add ingredients and spices to taste. 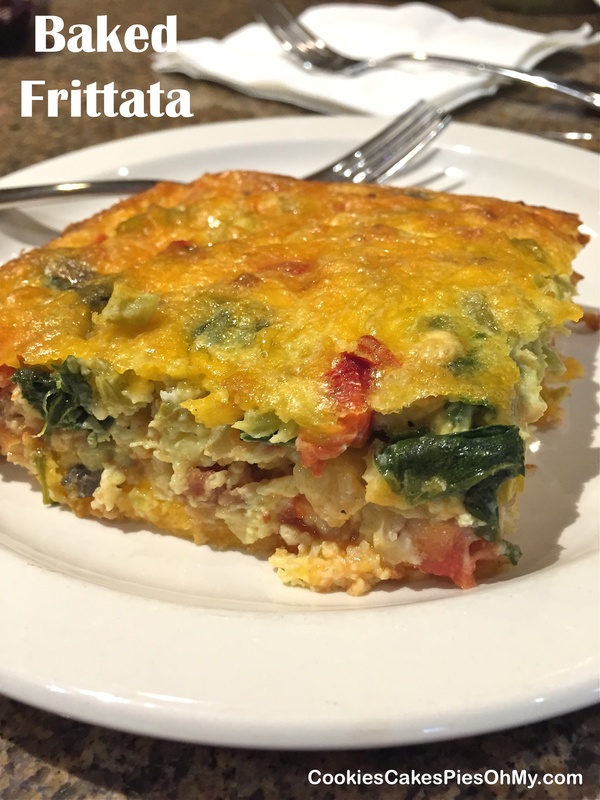 It can be meatless or not, make the full recipe for a 13″x9″ pan or half it in a smaller dish for fewer servings, it’s all up to you! Some ideas for added ingredients (this is what I did): Sauté onion, peppers, spinach. Browned sausage and/or bacon. Grated Swiss and sharp cheddar cheese. Diced tomato. Chopped green chilies. Sliced or chopped olives. Preheat oven to 350°. Sauté vegetables if using. In large bowl, whisk together eggs, flour, baking powder, salt, pepper, and other herbs or spices. Stir in all other ingredients. Pour into well sprayed 13″x9″ pan. Bake 35-45 minutes, until set in center. Remove from oven and let cool and set up for about 10 minutes. We also like a little salsa on top! My husband and I had this for dinner tonight and loved, loved, loved it! Amazing flavors all baked together and what great presentation. 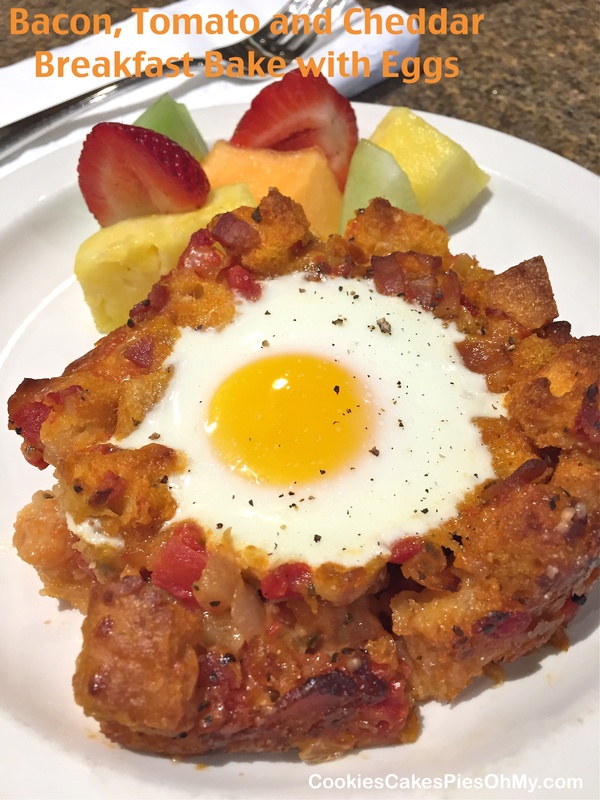 This would be a wonderful addition for a special occasion breakfast, brunch or just because! The recipe comes from foodandwine.com. Preheat oven to 350. In large bowl, toss bread with olive oil and spread on large rimmed baking sheet. Bake for 20 minutes, tossing once, until bread is golden and lightly crispy. Leave oven on. Meanwhile, in large skillet, cook bacon until crisp. Transfer bacon to paper towels to drain: reserve 2 Tbl of fat in skillet. Add onion to skillet and cook until softened. Add tomatoes and cook until liquid is evaporated, about 3 minutes. Return toasted bread cubes to the large bowl. Add contents of skillet, bacon, shredded cheddar, shredded Monterey Jack, chives and broth. Stir until bread is evenly moistened. Spread mixture in sprayed 9″x13″ baking dish and cover with lightly foil. Bake for 30 minutes. Remove foil and bake until top is crispy, about 15 minutes longer. Remove baking dish from oven and using a ladle, press indentations into bread mixture (you can do 6 or 8). Crack an egg into each indentation. Return dish to oven and bake for about 15 minutes, until egg whites are set but yolks are still runny. Cook longer if you do not want runny yolks. Serve right away while it’s warm. *I used a 28 oz can petite diced tomatoes, works great and no chopping needed. 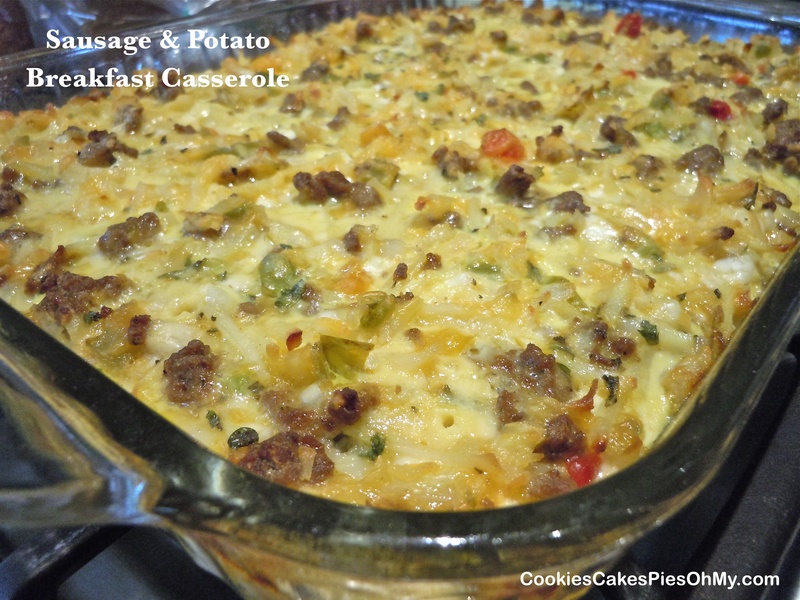 An easy casserole to put together for a quick flavorful dinner. 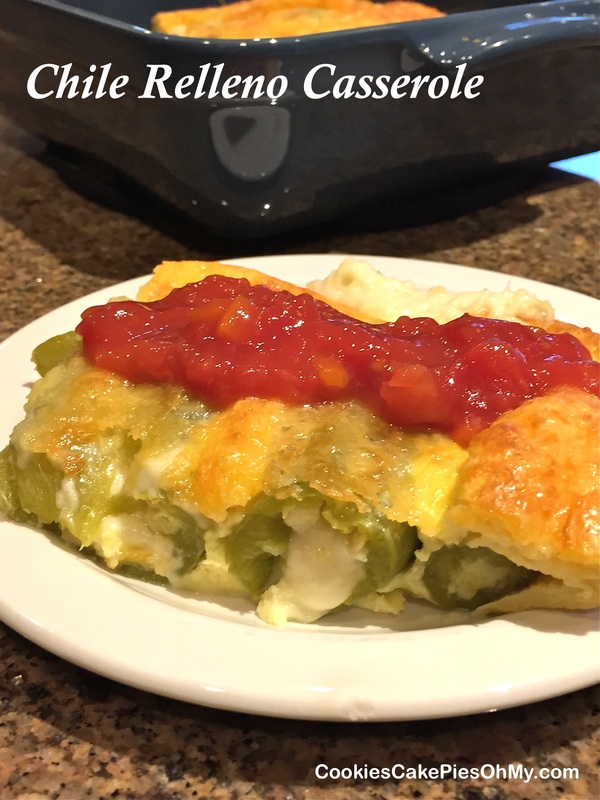 Cheese filled green chilies in a fluffy egg mixture, spicy, cheesy goodness! Preheat oven to 350º. Spray a 9″x13″ baking dish with nonstick spray. Drain cans of green chilies. Insert a strip of cheese into each whole chili. Place in baking dish. When all chilies have been filled with cheese and are in the baking dish, whisk together eggs, milk, flour and baking powder in a bowl. Beat until thoroughly combined and smooth. Pour egg mixture over chilies and sprinkle cheddar cheese evenly over top of egg mixture. 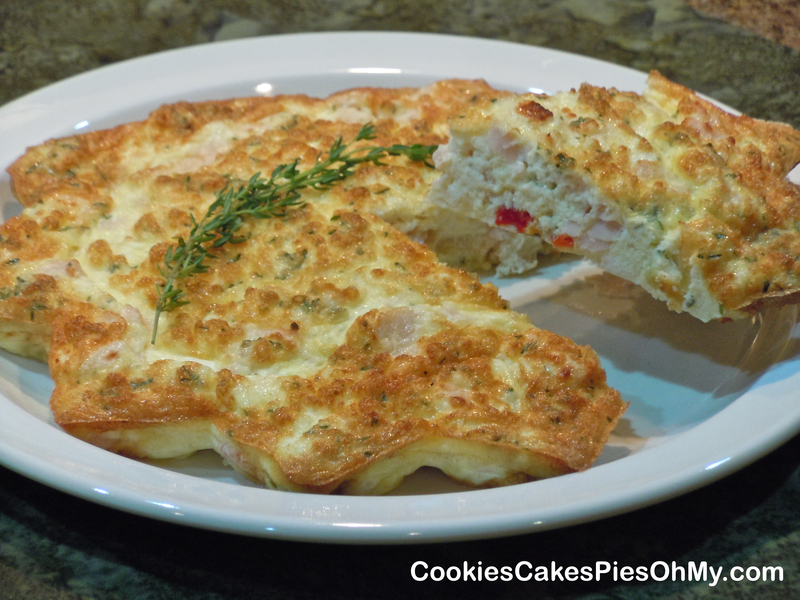 Bake for 30-35 minutes until egg is puffy, cheese is bubbly, and center is set. Let sit for 5 minutes, slice into squares and serve with salsa and sour cream if desired. I am not big on breakfast, I rarely eat in the morning. Yes, they (don’t know who they are) say it’s the most important meal of the day. I figure if I am not hungry, why consume the calories? 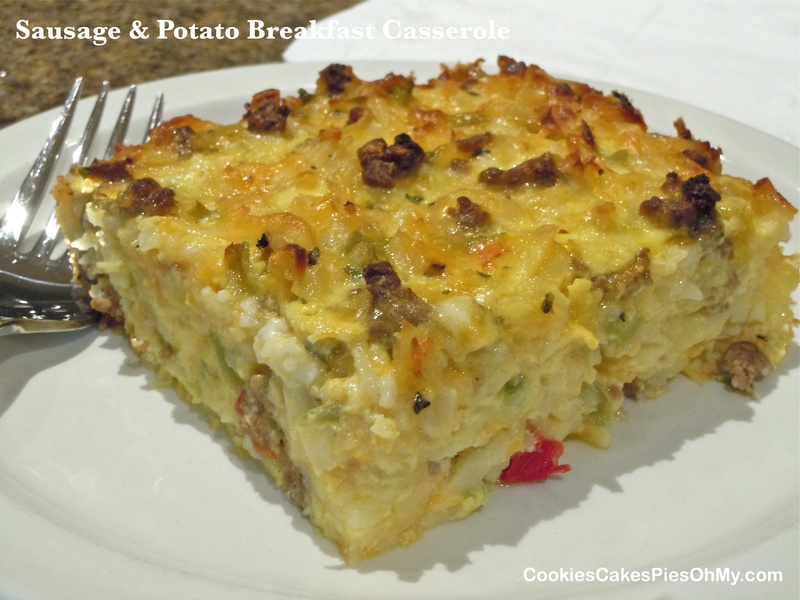 But, on rare occasions when I do eat breakfast, I love something like this sausage and potato breakfast casserole. Anything with sausage in it is usually alright with me, add peppers and green chilies that’s even better. Add mushrooms, tomatoes, substitute a different cheese, use ham or bacon instead of sausage, add different spices…make it your way. Preheat oven to 350°. Brown sausage in olive oil, drain. Add onion and peppers to skillet, cook until veggies are tender, remove from heat. 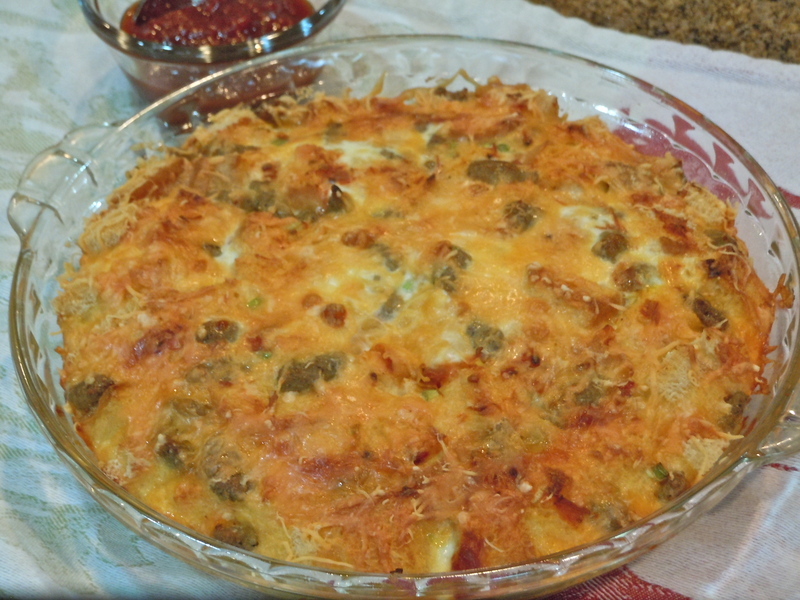 In large bowl, combine hash browns, green chilies, cottage cheese, and shredded cheese. 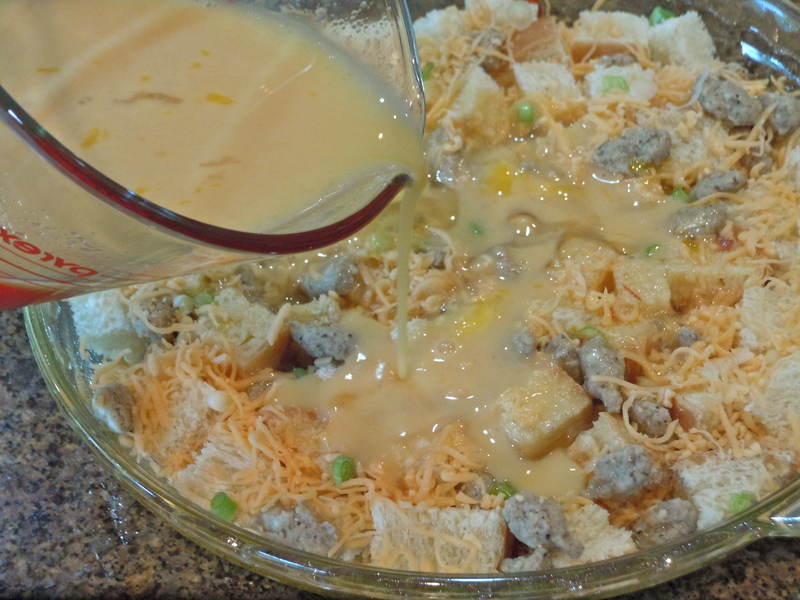 Stir in sausage mixture, Spread into sprayed 9″x13″ baking pan. In another bowl, whisk together eggs, salt, pepper, basil, and parsley, pour over potato mixture in pan. Bake for 50-60 minutes, until egg is set. Remove from oven and let sit 10 minutes before serving. Can be put together the night before, covered, refrigerated, and baked in the morning. Keep leftovers in the fridge, it is delicious warmed up in the microwave the next day. This is quickly put together and popped in the oven for a busy evening meal. A spin-off from a recipe at allrecipes.com. I did not want to use a 13″x9″, too big for us tonight, so this is a scaled down version for a 9″ deep dish pie plate. 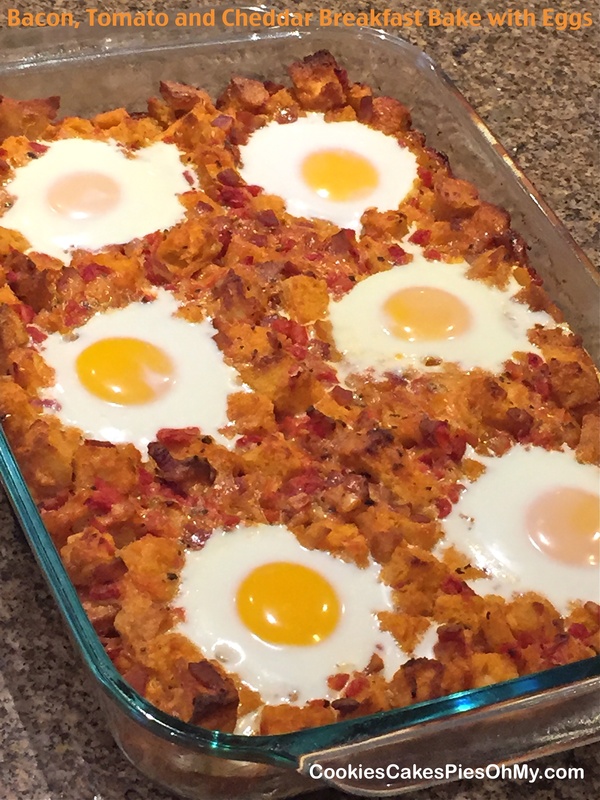 Their recipe uses ham, I substituted sausage, either way…yummy! Preheat oven to 350°. Spray 9″ deep dish pie plate with non-stick spray. Place half of bread cubes on bottom of pie plate. Sprinkle half of sausage evenly over bread. Sprinkle half of cheese evenly. Repeat with remaining bread cubes, sausage, and cheese. In another bowl, whisk together milk, eggs, chili sauce, green onion, salt, and pepper. 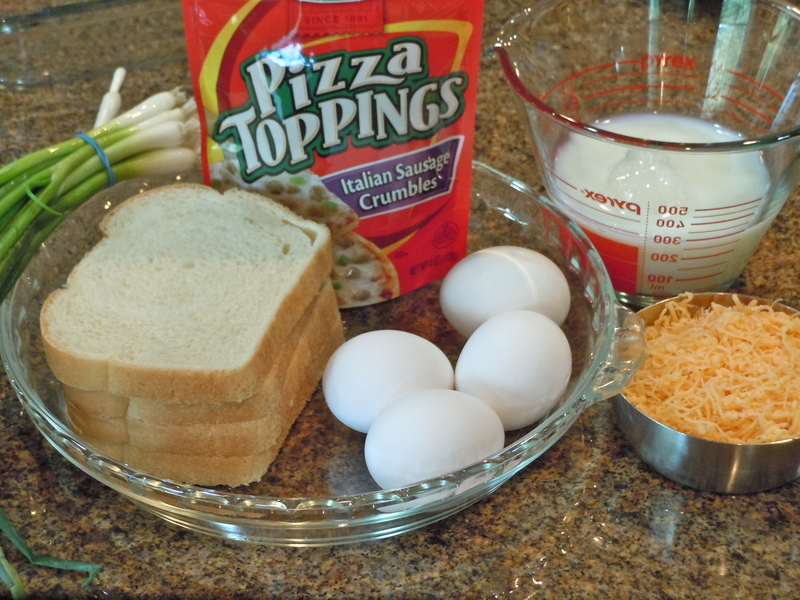 Pour mixture in pan over other ingredients (sprinkle more cheese on top if desired). Place pie plate on baking sheet with rim and place in oven. Pour boiling water into baking sheet and bake for about 40 minutes or until puffy and eggs have set. We have had this twice for dinner this week, just switch up the ingredients! Easy to throw together and a little different taste depending on what you add or take away. First night we had onion, potato, and feta cheese, the second night onion, peppers, ham, and feta, both good. Change up the type of herbs, cheese, meat and/or vegetable to make all different flavor combinations. 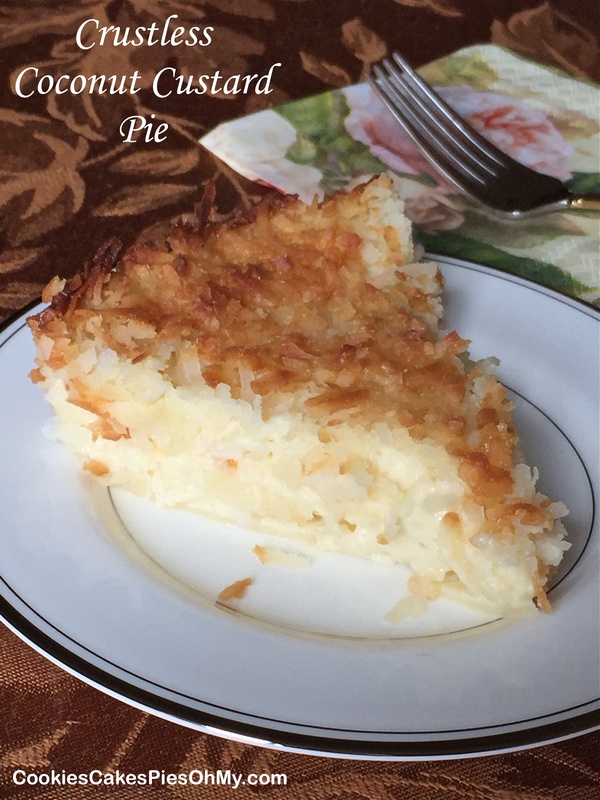 I love the ease of frozen chopped onion, frozen peppers, and frozen hash browns, always on hand for quick meals. Preheat oven to 375°. Spray fry pan with non-stick spray (or can use oil and/or butter) and saute onion, potato, and peppers until browned and tender. Place veggies in bottom of sprayed 9″ pie plate, round or square pan, I use a Demarle mold (no spray or prep necessary). Whisk together eggs, cream, thyme, and salt & pepper. Pour over veggies in pan. Bake for 20-25 minutes or until center is just set. This is a family favorite for dinner. 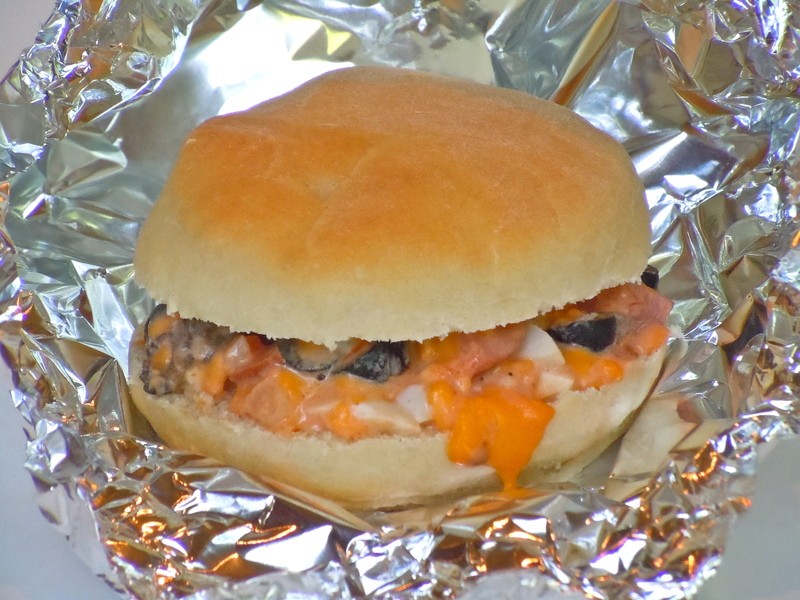 It combines lots of great flavors in a bun all warm and melted together! In large bowl for mixer, sprinkle yeast over warm water, and sprinkle sugar over yeast. Let proof until foamy. Mix in oil, flour, and salt. Knead. Place in sprayed bowl, cover and let rise until double, about 1 hour. Roll out and cut out buns (Makes about 16 4″ buns), place on baking sheets and cover to let rise about 1/2 hour. Bake in a preheated 375° oven for 15 minutes or until golden brown. Cool. 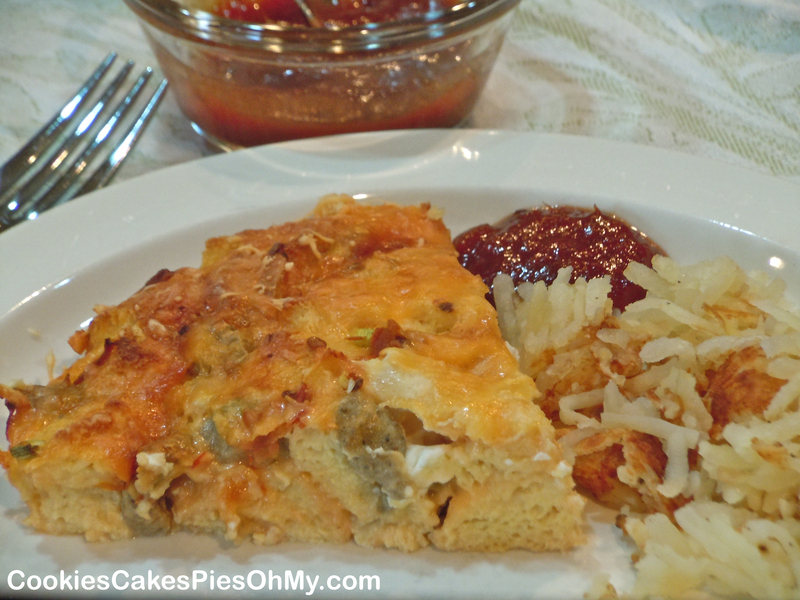 Mix together turkey, cheese, onion, olives and eggs. In separate small bowl mix mayo, chili sauce and celery salt, stir into turkey mixture. Spread on sliced buns. Wrap in foil, individually or in a group on a baking sheet and bake in preheated 400° oven for 15 minutes.